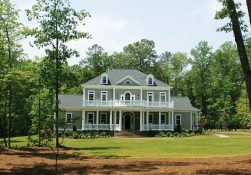 This furnished model home, a stately William E. Poole design, is majestically situated on a 3-acre corner homesite featuring a high elevation and a beautiful canopy of mature hardwood trees. • Abundant outdoor living spaces with front porch and balcony, covered rear and side porches, and large paver patio in back. Currently available for sale with East West Realty for $1,100,000.